Poker math is a vitally important aspect to No Limit Hold'em, but it is often overlooked or simply not used because many poker players fear it is too difficult to learn. I'm here to tell you it is not. In fact, fundamental poker math is very easy to learn. More importantly, it can yield you a lot more profits at the poker table. Without using simple math at the poker table, you are simply playing a guessing game. In this course I will teach you how to use simple arithmetic at the poker table to gain a huge skill advantage over your opponents that will allow you to win more and lose less. Poker players that don't use math are simply guessing and you'll learn to no longer guess and know the right mathematical move at the poker table. These simple mathematical concepts I will be teaching you will drastically help improve your poker game and allow you to make the most profitable decisions at the poker. First you will be introduced to some fundamental overarching poker concepts that apply to poker mathematics. Then we will begin our journey into poker mathematics where you will learn about probabilities and odds, pot odds and implied odds, pot equity, and expected value. You will then learn how to quickly estimate your equity at the poker table using the Rule of 2 & 4. Moreover, you'll learn the steps involved in determining if calling with a drawing hand is profitable or not. We will also cover how to size your bets with the best hand and teach you how often bluffs and hero calls need to work to be profitable. Lastly, we will show you how to perform EV calculations and better understand card combinations. Suitable for both beginning and experienced poker players alike, through this course of 22 lectures, which includes follow-along exercises and over 3 hours of content, you'll learn many essential fundamental poker mathematical concepts that will help you drastically improve your poker game. 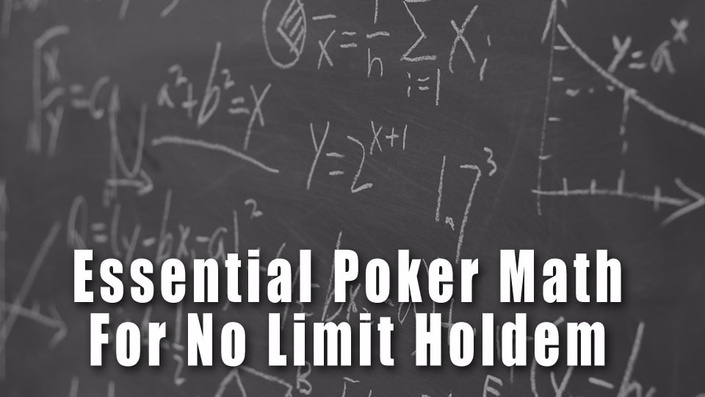 After taking this course, you will have mastered fundamental No Limit Hold'em mathematics. You will have gained a huge skill advantage over your opponents and you will be able to quickly and effectively use math at the poker table to make are always the most profitable move. Most importantly, you will become a much better and profitable poker player! SO WHAT ARE YOU WAITING FOR? JOIN FELLOW POKER PLAYERS LEARNING HOW TO QUICKLY IMPROVE THEIR POKER GAME THROUGH EASY-TO-LEARN POKER MATH!